Sonnenkopf is a pleasant Austrian ski area in the village of Klosterle. 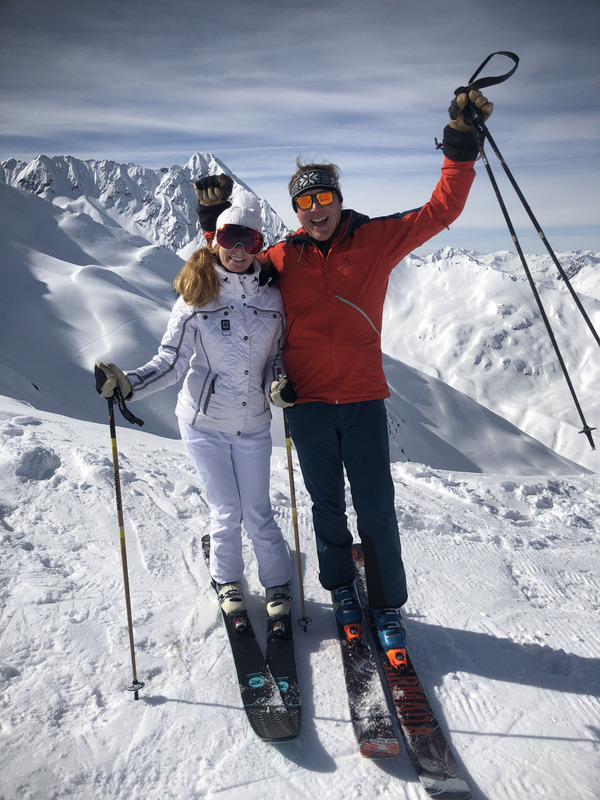 Its very family friendly with good elevation in The Arlberg region by St Anton just 5 minutes down the road from Stuben. In fact, you can see the ski terrain of Stuben from Sonnenkopf. 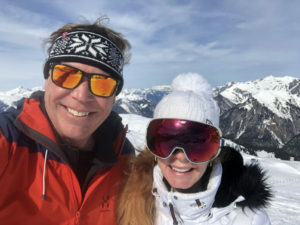 Sonnenkopf offers excellent value and as it is not interconnected to the rest of the Ski Arlberg region it is not too busy. Parking at Sonnenkopf’s modest base is free, and you are just a few steps to the Gondola building and ticket window. You can’t see the ski terrain from here, but you will… up the hill. Sonnenkopf’s long two stage gondola from the base brings you up 2,200’ of vertical to the upper mountain plateau and lifts in three directions. 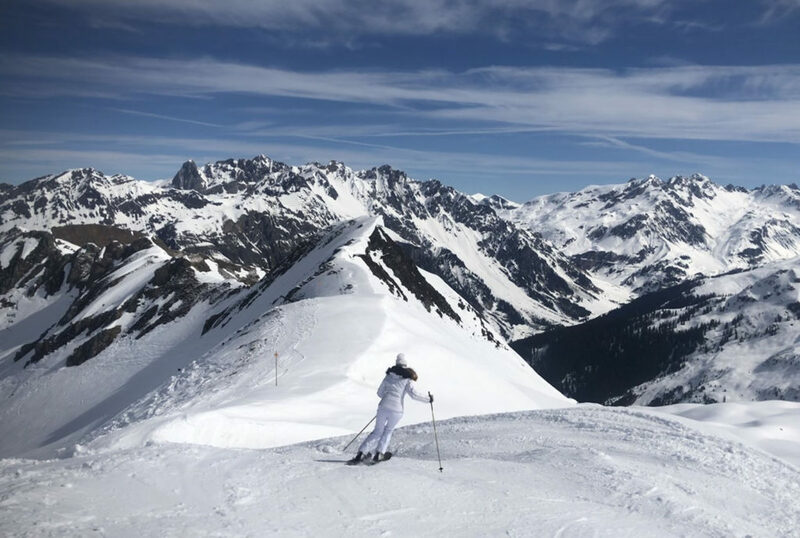 With two dozen marked ski pistes – trails marked 1 thru 19, two quads, two double chairs and a few tbars, Sonnenkopf is a great ski area for a day, typically sunny and very scenic with Alps surrounding you. 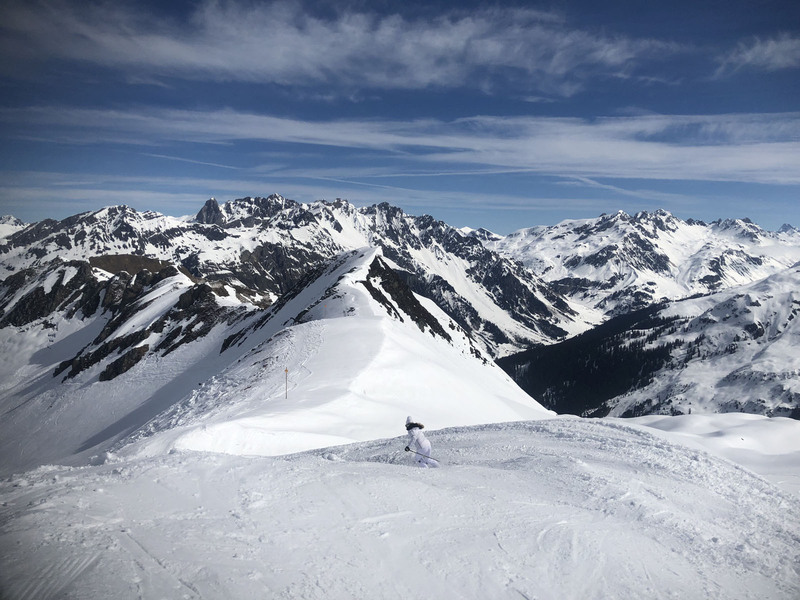 Sonnenkopf’s sunny well-pitched ski terrain served by a central quad on three well-prepared pistes offers spectacular views. 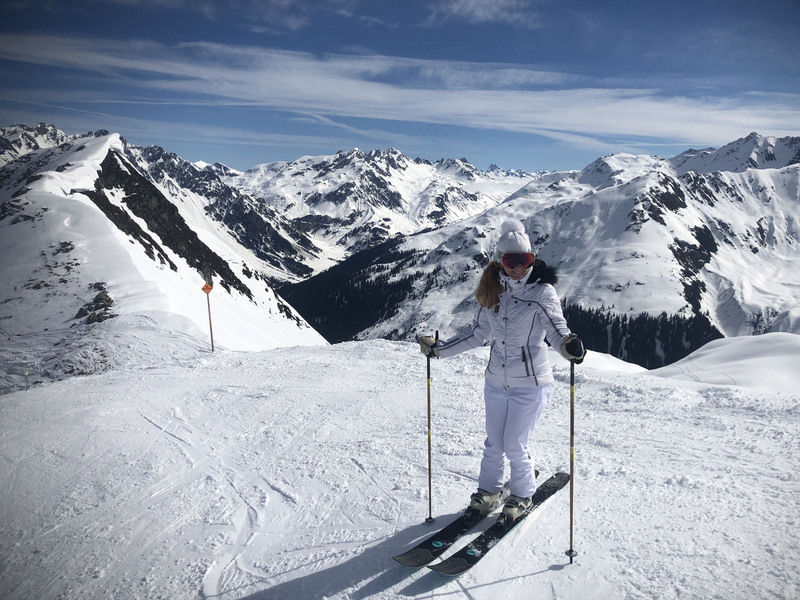 Atop the western most fixed grip quad is a beautiful day lodge with panoramas and a chic dining lodge inside lined with grand windows, a big sun terrace outside. From here free-riders have lots of off-piste skiing, easily reached off the trails are undulating bowls and fresh snow. 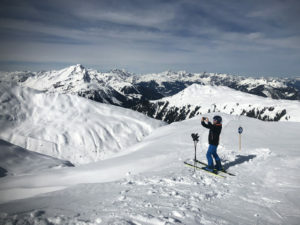 Sonnenkopf would be a powder paradise after a snow storm, with hundreds of acres of ski terrain. Hire a guide for a real adventure, and to be sure you make it back safely from some extreme adventures. 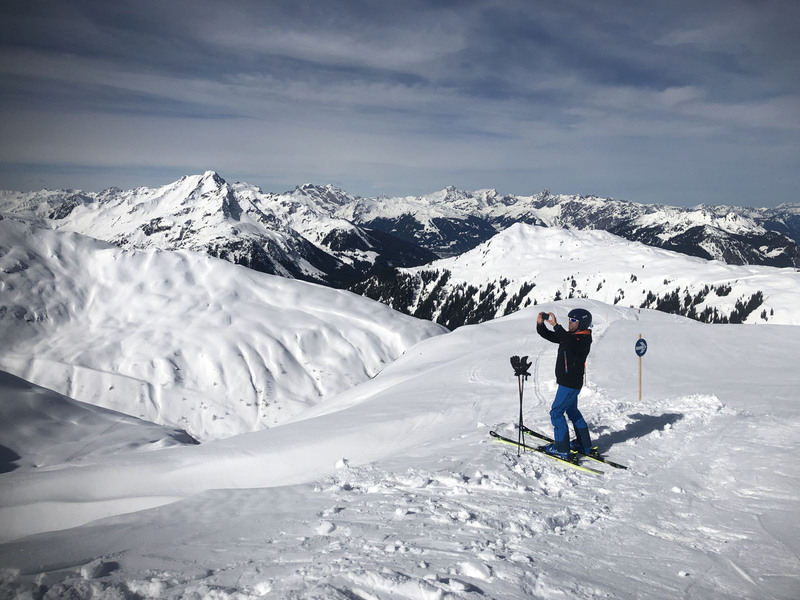 Two double chairlifts, consecutively, climb to Sonnenkopf’s highest point of 2,300 meters and steeper terrain. 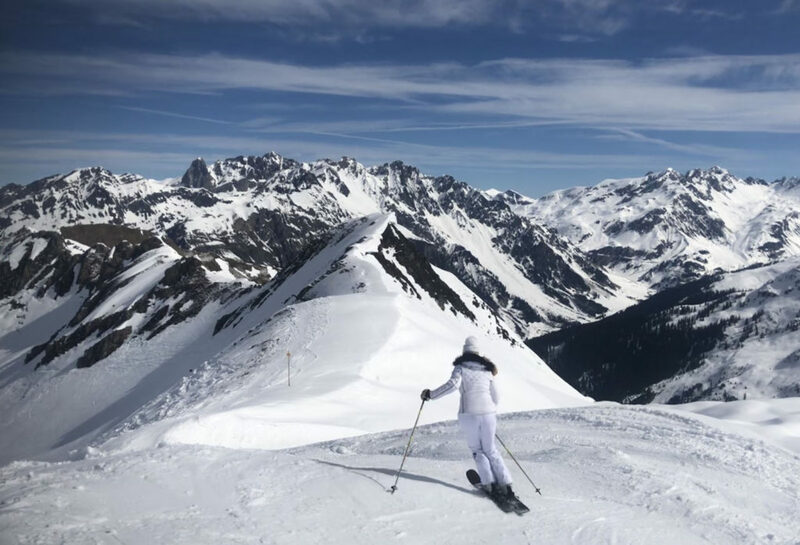 Here too you have access to tremendous off-piste skiing in bowls you can view from the chairlift and trails. Skiing down to the lower double chair, on black runs indicating their worthy pitch, pay attention to the crazy loading ramp bridge – only in the Aps do you see such marvelous engineering to squeeze ski lifts into otherwise impractical landscapes. Sonnenkopf’s central top of the gondola base area is home to kindergarten and ski school and Bearland (a kid friendly ski zone). There’s a modern spacious base lodge here with a great umbrella bar attached to the dining area on the second floor. 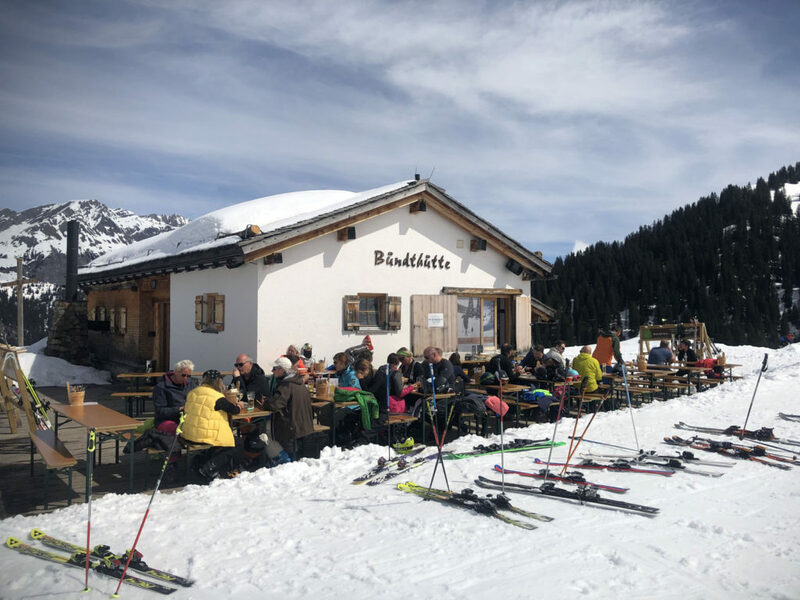 BündHütte on Run 1 on way to the base is a great chalet for lunch, with an entertaining ski slope views and delicious food. 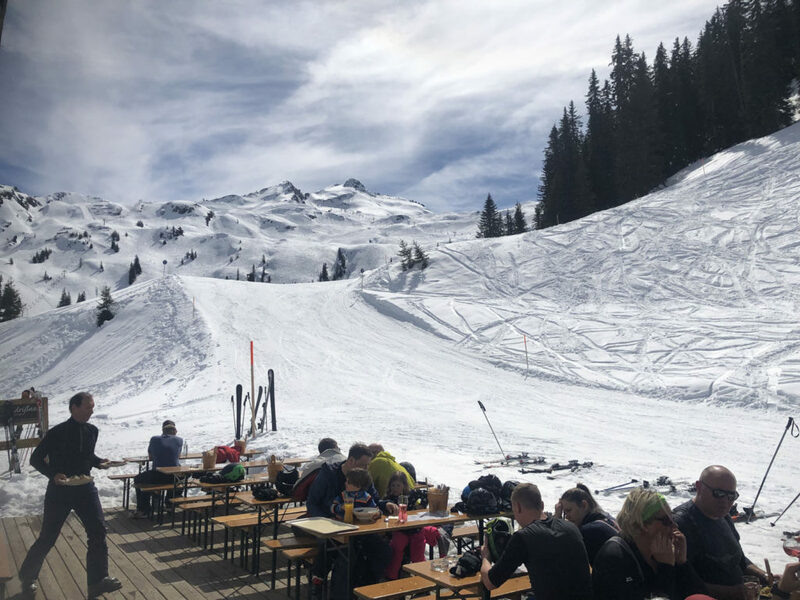 The soups and daily specials are served piping hot and fresh, order inside and pick up at the window, and the Gluwein was warm and spicy – perfect for a spring picnic outside at the sunny tables. At ski days’ end, you can download Sonnenkopf’s gondola from the upper mountain, or ski the Trail 1 all the way down to the valley floor and parking area. 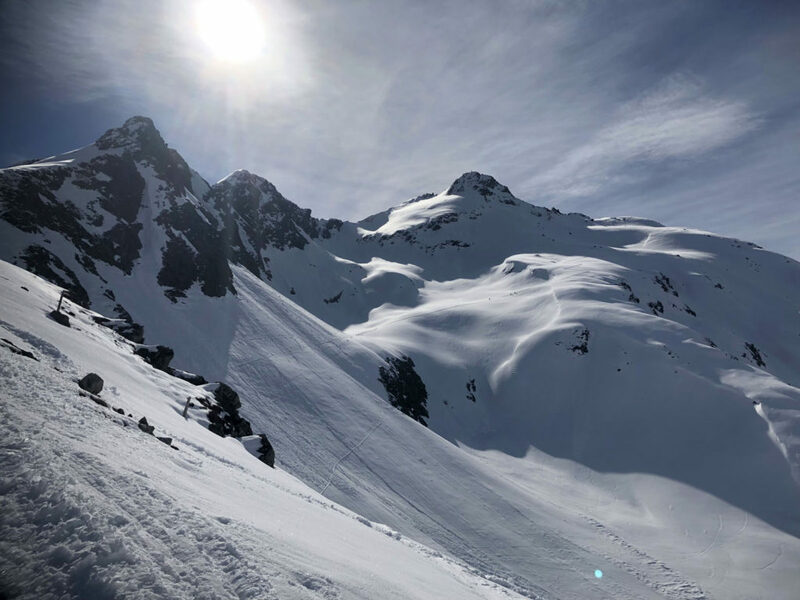 This trail zig zags and is rather narrow in places, so if you are fatigued from your ski day, or the snow has turned warm (like mashed potatoes moguls) – there’s no shame in riding the scenic gondola down. For apres ski at Sonnenkpopf, there is just one bar at the base, the Kelo Bar tucked above the gondola loading station, at the end of ski Trail 1. Some nights, this humble wood chalet rocks for après ski with locals and skiers partying to a DJ in the late afternoon to early evening. 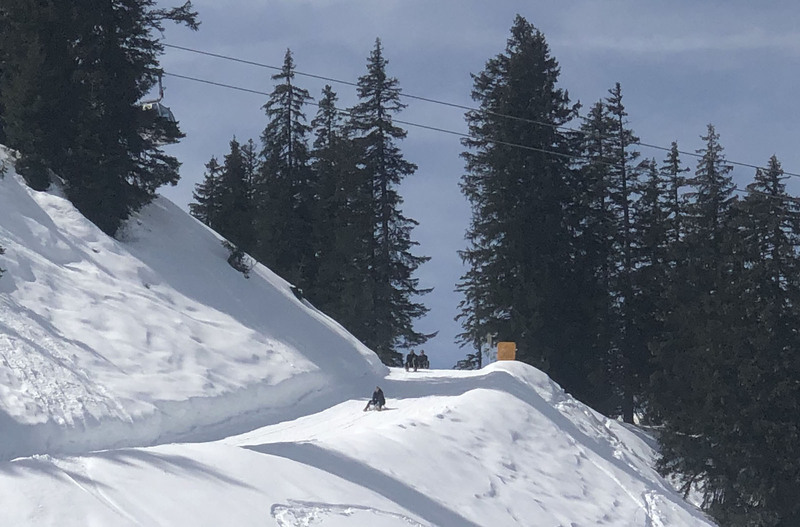 When there’s only one ski area bar, it tends to be popular and reach critical mass, like Patchi at Serfaus, and the Trap Bar at Grand Targhee. See our list of the best aprés ski bars. The village of Klosterle is quiet, rustic, dotted with farms and modest homes. A few basic chalets rent rooms, nothing fancy, in Klosterle a two-minute drive to Sonnenkopf’s base. The town has three modest restaurants serving typical Austrian fare. There’s a Spar grocery market as well. Klosterle is so dramatically different and humble, compared to nearby cosmopolitan St Anton am Arlberg, 20 minutes way, which is loaded with fine hotels, beautiful historic chalets, chic ski shops and so many aprés ski bars and restaurants surrounding the ski slopes reached by modern lifts. Nearby Stuben, is a far more authentic and charming ski village tucked into a dramatic mountain valley, with a dozen fine hotels and alpine chalets, and some wonderful aprés ski bars and dining like Fuxbau and Hotel Post which both have incredible scenery and alpen glow over the Austrian Alps in the afternoon.